Active ingredients: Each 50g of ointment contains: Silicea 6X 0.5g; Symphytum officinale 8X 0.375g; Arnica montana, radix 2X 0.15g; Rhus toxicodendron 2X 0.135g; Sulphur 6X 0.135g; Sanguinaria canadensis 2X 0.113g; Dulcamara 2X 0.038g; Coenzyme A 6X 0.005g; Nadidum 6X 0.005g; Natrum oxalaceticum 6X 0.005g; Î±- Lipoicum acidum 6X 0.005g; Cartilago suis 2X 0.0005g; Embryo suis 2X 0.0005g; Funiculus umbilicalis suis 2X 0.0005g; Placenta suis 2X 0.0005g. Warnings: For external use only. Do not apply to large areas of the body. If symptoms persist or worsen, or if a rash develops a physician should be consulted. In rare cases, allergic skin reactions may develop. 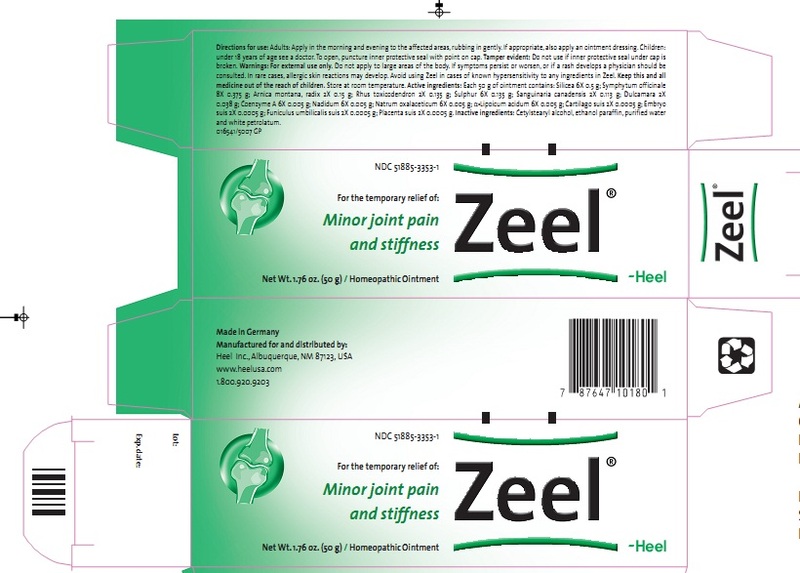 Avoid using Zeel in cases of known hypersensitivity to any ingredients in Zeel. Direction for use: Adults: Apply in the morning and evening to the effected areas, rubbing in gently. If appropriate, also apply an ointment dressing. Children under 18 years of age see a doctor. Inactive ingredients: Cetylstearyl alcohol, ethanol, paraffin, purified water and white petrolatum.